In an effort to shift existing power dynamics, the new charter is the first industry-specific vertical to join the growing TIME’S UP™ movement March 12, 2018 – Today, a group of women advertising agency leaders announced the launch of TIME’S UP™/ADVERTISING, the first official vertical under the TIME’S UP™ movement, which was launched at the end of 2017 by women across the entertainment industry. The ultimate goal is that stand alone TIME’S UP verticals such as TIME’S UP/Advertising help pave the way for every industry to take a critical look at its organizational structure and systemic imbalances to ensure safety and equality for everyone, everywhere. 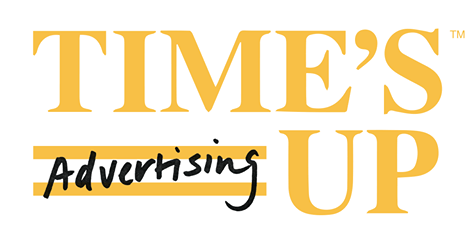 TIME’S UP/ADVERTISING will drive new policies, practices, decisions, and tangible actions that result in more balanced, diverse, and accountable leadership; address workplace discrimination, harassment, and abuse; and create equitable and safe cultures within the advertising industry. The group will host the first TIME’S UP/Advertising community meetings on Monday, May 14th in New York, Chicago, San Francisco and Los Angeles. Women within advertising agencies are invited and encouraged to bring their voices and recommendations to these meetings to ensure a range of expertise and experiences is incorporated as the charter is built and developed. More than 150 women CEOs, CCOs, CSOs, and other C-suite executives (or equivalent) in leadership positions at advertising agencies across the United States launched TIME’S UP/Advertising by publishing a letter entitled “Hey, Sisters,” which announced the initiative and outlined the goals of this newly formed group. TIME’S UP/Advertising is encouraging any company in the advertising industry—whether or not it is run by a woman—to join this effort by committing to the items listed on the TIME’S UP/Advertising website (timesupadvertising.com). TIME’S UP/Advertising will post goals and track progress on its site. TIME’S UP/Advertising will also drive contributions and raise funds for the TIME’S UP Legal Defense Fund, which provides subsidized legal services for individuals subjected to workplace sexual harassment and abuse. TIME’S UP is a unified call for change for women everywhere. From movie sets to farm fields to boardrooms alike, we envision nationwide leadership that reflects the world in which we live. Powered by women, TIME’S UP addresses the systemic inequality and injustice in the workplace that have kept underrepresented groups from reaching their full potential. We partner with leading advocates for equality and safety to improve laws, employment agreements, and corporate policies; help change the face of corporate boardrooms and the C-suite; and enable more women and men to access our legal system to hold wrongdoers accountable. As one of its first initiatives, TIME’S UP launched the TIME’S UP Legal Defense Fund (TULDF)—which has since raised over 21 million dollars to support women and men who face workplace sexual harassment connect with legal representation and public relations assistance.